Once in a while, we see a “footprint” of God, and we know we are on the right path! This happened just last weekend, while friar Bao and I were hurriedly preparing for a Friday night prayer service at the end of our first day of our “Come and See” weekend experience (retreat). Friar Bao took an old San Damiano Cross from off the wall, and we wanted to place it on the alter, but had no way to make it stand on its own. So we found a 3-foot high pedestal, made of marble, designed to hold a candle stand. It had a marble base, and was a slim column supporting a small pedestal at the top. We placed this in front of the alter, and then sat the San Damiano Cross on top of the pedestal, leaning it against the front of the altar. Success, it stayed! Knowing it would be too awkward for our retreatants to light a candle in the dark, we next we placed 8 small, lit candles at the foot off the pedestal, and requested that after a while of silent prayer, a retreatant would go and simply lift one of the already burning candles from the foot of the stand to the pedestal on top. We began our prayer. I introduced the prayer with a brief overview of the call of St. Francis, and how he heard God’s voice speak to him; “Francis go repair My House, as you can see, it is in ruin”. Then I notified the retreatants that we would turn off the lights, and gaze upon the cross in silent prayer, and after a while, if so moved, they were invited to come and lift a candle from the foot, to the top of the stand, and put it on the pedestal that was also holding the cross. I turned off the lights. 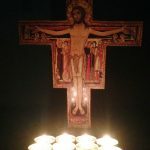 I was immediately disappointed, thinking that we should have planned this prayer better, because as soon as the lights were off, you could not see the image of Christ on the old San Damiano Cross! We sat there in the dark, unable to see what I had planned to be the whole focus of the prayer; the image of Jesus on the Cross that spoke to St. Francis. Then, to my surprise, after a few minutes, one person went up and lifted a single candle from the floor, to the foot of the cross. And Behold! For the first time in the prayer, you could, dimly, see the image of Jesus! Then, as more people got up, lifted their light to God, and placed more candles at the feet of Jesus, more and more, his image became visible! Yes, I can be a follower of Christ all by myself. If I have found God, and allow His light to shine in and through me, my life can make the world a brighter place. As has been said, “Not even all the darkness in the world can overcome the light of a single candle.” However, we are not meant to be Christians alone. Together, our light can make Christ much more VISIBLE! Jesus did not choose one disciple, he chose twelve. Jesus did not come to save just me, but all people. Christ is most clearly seen when Christians together work, pray, and make Him present! This Sunday’s readings for the 7th Sunday of Easter, are from John Chapter 17. This chapter is famously known as Jesus’ Prayer. In verses 21 – 23 Jesus prays; “May they all be one, just as, Father, you are in me and I am in you, so that they also may be in us, so that the world may believe it was you who sent me. I have given them the glory you gave to me, that they may be one as we are one. With me in them and you in me, may they be so perfected in unity that the world will recognize that it was you who sent me and that you have loved them as you have loved me.” We Christians pray to God. We ask God to for our needs, our desires. We ask God to answer Our Prayers. Have we ever thought of ANSWERING GOD’S PRAYER? This is Jesus’ Prayer! That we be one, united, and displaying God’s light and Love so brightly that the world may see in us, JESUS! The purpose of our life is to answer God’s prayer, not that God should answer ours! Why not offer to serve God, rather than ask God to serve us? And, as God has requested, let’s do it together so that our light will be combined with the light of other Christians, and together we will make Christ more visible in our world today! Like the participants of that Friday night prayer vigil did as they came forth and lifted their light to the foot of the Cross, why not lift our light to God? Let us act in ways that make Christ more visible to others! We can do that in our families, in our community, in our places of work, or at school. We can do that in our Churches and in our world! Wherever we are, we can do that starting today! And, for some, why not do that with the FRANCISCANS? The Conventual Franciscans are a fraternity of men, each bringing their gifts and talents, and light of faith, to a brotherhood. A community united in Love, serving God and together each letting their light contribute to the greater light. This is the most powerful witness of Christ among us. I recall when I was first attracted to the Franciscans. It was not so much because of any one friar, but it was because of “The Friars”! My greatest joy is not ministering alone, but with others in fraternity! Together, let us bring our light to the foot of the Cross, and answer God’s Prayer. Together let us follow the “Footprints of Jesus”. Join us on our next “Come and See” weekend! Slide to View Pictures and See What Happened at our Last Come and See Weekend!